The French Institute in Estonia is a member of the French Institutes and French Alliances’ worldwide network. The IFE is a digital content-oriented institution and focuses on all contemporary forms of art. You are an artist, an editor, a translator, head of a French cultural society ? You wish to work with Estonia or with the French Institute in Estonia ? You would like to display your work, find contacts, join a mobility program ? You are Estonian and wish to find partners in France in your scope area, join a residency or a training program ? Don’t look any further. The French Institute will help you make useful contacts and get all the information you need. You can also apply to our various calls for proposals, that aim at promoting French art creation worldwide. To apply, log onto IF PROG, www.institutfrancais.com, our digital platform dedicated to calls for proposals, and managed by the French Institute. Your project must show a natural connection with France or French-language. The application must be sent as early as possible to enable us to examine it. In general, applications are submitted before October 15, for a project realization the year after. The French Institute in Estonia launches two major cultural seasons each year : first in March with the “Fête de la francophonie”, and later on the Accord Festival (last one in November 2015). Each of these events is set up with Estonian partners : your ideas are welcome ! We recommend you present us your projects 6 months before they are carried out. The French Institute, located in Tallinn’s old town, provides a central venue for your exhibitions and events. You wish to exhibit your art, perform French music or host a round-table debate ? Then again, your ideas are most welcome ! The 1iJ project is coming to Tallinn ! 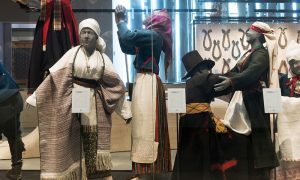 Discover the treasures of the Estonian National Museum in French!